It is always amusing to me how all the "Starship Troopers" completely seemed to have misunderstood the Paul Verhoeven 1997 classic, by going for action and spectacle rather than political satire, but oh well. The sequels- and especially these animated movies, are mostly its own thing and you know what, it is quite good and enjoyable for what it is. Certainly nothing too surprising or new to watch, but as a simplistic action flick it is a pretty entertaining one to watch. The story is pretty basic and it does lack any true originality and surprises in it, but it least knows how to keep things going and fun to watch, all throughout. It doesn't really waste any time on any of its characters or dialog and it basically throws you right into the midst of things. It is a never ending science-fiction action spectacle, that besides is a visually impressive one to look at. Ah yes, I remember the days they had to build islands full with computer hardware in order to make these type of animated movies. Nowadays it probably gets done on a handful of 'comon' computers, by only a small group of people, while looking just as good- if not better, as big budget computer animated movies from 10 years ago. The animations are smooth, the action spectacular and the characters convincing looking, though for some reason Johnny Rico looks more like Solid Snake nowadays. The movie otherwise does a pretty decent job 'honering' the look of the original movie and despite its endless possibilities decides to never overdo anything. There is nothing in this movie that couldn't have happened in any of the live action movies as well. It still remains a flawed movie as well. Especially story-wise it can get a bit weak at times. 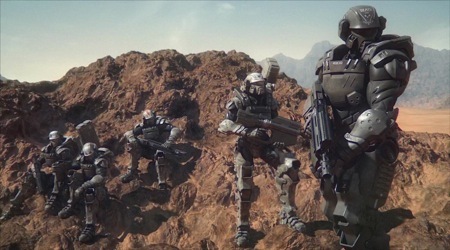 For some reason the movie wants to bring back as many characters from the first "Starship Troopers" movie as possible, but without a real good reason. Most of their roles are pointless and it besides is confusing how none of them look like any of the original characters. Probably something to do with copyright, that prevents them from using the likeness of any of the actors portraying the original characters. I also wasn't too impressed with the main villain of the movie. Her character is good, but her motives very weak and questionable. She is supposed to be the smartest woman alive (the movie its own words), yet she makes the one stupid and unlikely decision after the other. I also believe that these movies don't need any real 'James Bond' type of human villains anyway. Just let the Arachnids do that job! But I still have to admit that I enjoyed this movie far better than I expected. There is never a boring moment in it and while the story is simple and straightforward it still works well for this particular movie. The setting, the action, the characters, it is all quite good, even if you aren't that familiar yet with the Starship Troopers franchise.